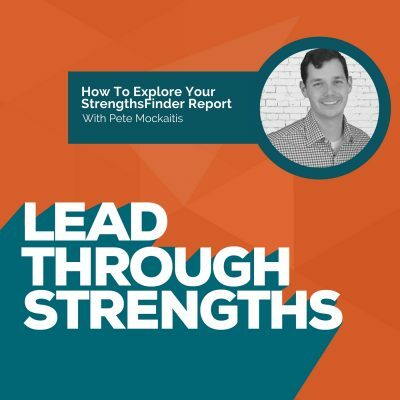 This week Lisa speaks with Pete Mockaitis, who joins us in a live example of what it’s like to explore your StrengthsFinder results for the first time. You can reach Pete through the Awesome at Your Job website. You can also connect with him on Twitter and LinkedIn. And you should because he’s awesome! Here’s the link to Pete’s podcast, and to his interview of Lisa Cummings. Term: Leadership Domains as explained by my friends at Leadership Vision Consulting. They’re another firm who offers Strengths based leadership training. Lisa Cummings: [00:00:08] You’re listening to Lead Through Strengths, where you’ll learn to apply your greatest strengths at work. I’m your host, Lisa Cummings, and I’ve got to tell you, whether you’re leading a team or leading yourself, it’s hard to find something more energizing and productive than using your natural talents every day at work. And today you’re going to get a really unique episode on StrengthsFinder. It’s different from our usual guest interview. Today, your guest joins us in a live example of what it’s like to explore your StrengthsFinder results for the first time. So I think a lot of guests are going to identify with his love of learning and his corporate experiences. He’s actually a former consultant for Bain so he has that pedigree company thing on his list that many of you. And today he’s the trainer and chief at Awesome At Your Job, so you’ll hear more about that and his show as we dig in. So, you know, if you’re a regular listener of this show that we’re going to talk about how his differences are his differentiators. So you’ll enjoy hearing a fun fact about him. So, here it goes. This guy has a unique talent of being able to clap with one hand. So, Pete Mockaitis, welcome to the show. Please give yourself a one-handed welcome and demonstrate for us. Lisa Cummings: [00:01:40] I can’t believe that is really happening with one hand. It is blowing my mind. You’re going to have to make us a video so we can see what that actually looks like. I can’t believe that’s possible. Pete Mockaitis: [00:01:51] I can do that, yes, and that’s probably my number one strength is one-handed clapping. It opens a lot of doors. Lisa Cummings: [00:01:58] [laughs] Your hand can open a door in a traditional way…but his hand…watch out. Pete Mockaitis: [00:02:01] Oh, well-played. Lisa Cummings: [00:02:05] Watch out. Oh, my gosh. We’re going to totally have this video on the show notes, so if you’re listening click on over to that because that’s a serious talent. I love it. [laughs] Okay, let’s get into the serious side of super powers. That’s one, I tell you, parlor tricks though they could fuel the Woo that you have up in there. I think there’s something tied here. Maybe that’s how you discovered it. Maybe we’ll uncover that today. Pete Mockaitis: [00:02:30] Oh, are folks being won over as we speak, or are they turned off? We’ll see with your emails that come flowing in. Lisa Cummings: [00:02:35] That’s right. Okay. So, you know in this episode, we’re going to do this like a sample of exploring your StrengthsFinder talents for the first time. Well, we’re going to have to start by telling them what your Talent Themes here. So give them your top five. Pete Mockaitis: [00:02:50] Okay, can do. With just the words or the descriptions as well? Lisa Cummings: [00:02:54] Let’s get a little “Meet Pete” moment. So do the word and also the one sentence what this looks like on you. Pete Mockaitis: [00:03:03] Okay. So, first, I’ll give a quick preview – one, Ideation; two, Strategic; three, Learner; four, Activator; and five, Input. 1) Ideation, it’s true I am fascinated by ideas and how they connect together on my podcast with guests. I eat it up when I see “Oh, wait, there’s one thing someone said” can combine with that other thing they said, so I’m going to focus on prioritizing with the one thing but also building some tiny habits and, boom, there’s this combination synergy goodness, and so that resonates. 2) Strategic. I buy that in terms of if I’m always thinking about sort of what’s the optimal path forward, that’s the name of my company – Optimality, LLC – getting the band for the buck and sort of that 80/20 Rule and action, I’m really after that. 3) For Learner, it’s true. Ever since I was a youngster that’s kind of where my trainer and chief story starts. I was always going to the library reading books about goal-setting, success, teamwork, collaboration, influence. I was just into that stuff, and I remain to this day. 4) Activator, it’s true. I am often impatient. I’m excited to put things into action. Just this week I was thinking it’s just too much trying to manage the guests with merely emails and spreadsheets. I need a CRM, customer relationship management piece of software, and five hours later I had tried nine of them and made my decision. So, yeah, I got after it right away. That’s kind of my nature. I’ll wake up and I’ll have an idea and I just want to like run to the computer and implement it. 5) And then, finally, Input. I do, I love to get perspective from wise folks and learn all that they have to offer and collect multiple opinions to really prove or disprove the sort of key facts or assertions that are going to make or break a given decision. Lisa Cummings: [00:04:59] These are so good. Thanks for adding the Pete color because even for people who don’t understand the basic definition of it and Gallup’s terminology you explained it and then added your individual color. Just seeing as a kid in the library, I’m imagining you going back and training them so it’ll be fun to hear the depth on that. And then Activator, one that just happened the other day. It’s just a really great specific example so we can see what these are like in real life. So, let’s talk about if we really relate this to career, and you think back on one of your proudest accomplishments, tell us about that snapshot in time. Pete Mockaitis: [00:05:40] You know, I’m thinking, the first thing that leaps to mind is just getting the job at Bain & Company itself. I’d say it was very meaningful to me because I had been interested in it for some years before it came about, and it was just a vivid moment. I can recall when I was emceeing a date auction event as a fundraiser in college for a student organization, and when I got the call I just handed the microphone to someone, walked off stage, received the call. It was great news. I was excited. I hugged my friend, Emily, who was wearing a red puffy coat. It’s forever enshrined in my brain as like the moment that this thing I had been after for some years was now mine. Lisa Cummings: [00:06:31] I love how vivid your imagery is and all of these. Take us through the preparation, what it was like for you getting ready for applying for this job, making it a thing. It sounds like it was a long time coming. So how was that playing out in your life, leading up to that phone call? Pete Mockaitis: [00:06:49] Oh, sure thing. Well, I was sort of an odd kid in my sort of freshman year of college. I was sort of determined like, “By golly, I want to work in a top strategy consulting firm when I graduate, and so that’s just what I’m going to do.” And so I began exploring different avenues very early on in terms of student organizations and what were the linkages and how I could have sort of a distinctive profile that I would be intriguing to them. I went to the University of Illinois Urbana-Champaign which is not a hotbed for recruiting into those firms, but there are a few each year who get in, and I wanted to be one. So, I remember I would sort of try to find the right people, and the right organizations, and learn from them and see what I could do. And I remember, talk about vivid experiences, I was chatting guy named Bo who was wearing a Harry Potter wizard hat at a Halloween party. And so I was excited to discover that opportunity and then go after it. Then once I met a real person named Jeff who had the position, I was just having a real lot of fun chatting with him and seeing, “Hey, what’s it like on the inside? Is it really what I’ve built it up to be?” and sort of receiving that reinforcement that it was good. And then, ultimately, I think the biggest hurdle to get the job is the case interview where you have to sort of solve business problems live before the interviewer’s eyes. And so I did a lot of prep. I got the books, I even recorded myself doing case interviews. I’d listen to them back to see how I was doing and to see how I might tweak it to seem more engaging or succinct and insightful. I remember I was listening to myself doing case interviews while driving up to the interview the day before. So those are things that leap to mind there. Lisa Cummings: [00:09:06] Those are so good. Now, if you look at your talents, and then you try to make some linkages, now I’ve made a bunch of linkages and I’ve even, although the listeners can’t see your list beyond your top five, as you would not be surprised if you know a Learner and Input. Pete immediately goes out and wants more input and grabs the full 34 premium version of assessment so he can see the whole lineup. So I see a bigger lineup and I have some things popping into my head about your number 6, Connectedness, and your number 7, Woo. But when you look at your list and you think back on that experience, what links do you see where you’re using those talents as you’re preparing? And so the interestingness is not quite enough to offset this. And then with Ideation, I think I did take some novel approaches to having distinctive profile, like I authored a book in college about leadership and student organizations, and I saw the opportunity to be the Secretary General of our model United Nations, which I thought, “Well, that’s a really cool leadership opportunity in terms of managing dozens of people and thousands of dollars to put together an event for hundreds of folks. Ooh, that’ll be a real nice concept to make an impression, as well as having a ton of fun.” So I was a pure career-seeking robot along the lines. Lisa Cummings: [00:11:30] You’re bringing up what happens for a lot of people where if they heard the descriptors in the StrengthsFinder Talent Themes, and they listen to the thing that you just described, they would probably think, “Achiever” because it seems like the easy way to describe what you accomplished. And although Achiever is middle of the road for you, 13, it’s not extraordinarily high but you found extreme achievement at that age. So, you’re demonstrating something that’s really cool which is I always tell people. StrengthsFinder doesn’t tell you what you go do in your career. It’s more about how you can go do it, leaning through the talents you have. So you found achievement through totally different talents and it’s dangerous to try to look at the words on the surface. And I think if I listened to your show, which I do. Pete Mockaitis: [00:12:21] Oh, thank you. And Talent Themes show up more in how you approach what you do not necessarily what those interests are. So, kind of fascinating thing you’re bringing up. So, tell us about yearnings and interests, like Monopoly and research studies and proof points, and things that you talk about in your show and how your Talent Themes speak to those. Pete Mockaitis: [00:13:14] Oh, that is interesting in terms of just what’s fun. So, on my honeymoon, just a few months ago – Yay. And for Monopoly, it’s so funny. I remember one time I was meeting this guy for the first time, his name is Peter; fine name, fine guy. Lisa Cummings: [00:14:09] Fine name. Pete Mockaitis: [00:14:11] [laughs] And so as we were playing Monopoly he kept asking me some questions about my career journey and how I went into Bain and why I left Bain and started my own business and these things. And I’ll tell you what, I was so focused on the strategic options and decisions I had to make in that game Monopoly to win I actually had in my head the idea that this guy is trying to distract me in order to win at Monopoly. Pete Mockaitis: [00:14:41] I thought, “Pete, that’s crazy. Most people don’t care. They play games to socialize in fun ways.” [laughs] I was being a little rude in retrospect. I kind of apologized to him. I gave him very short answers, I was like, “Well, ultimately, that’s just something I’ve always loved to do.” You know, just one- or two-sentence responses. Lisa Cummings: [00:15:01] Let’s get back to the seriousness of Park Place, buddy. [laughs] Okay. So, now what you’re helping me see and raise is this concept of domains. I don’t know if you know this about StrengthsFinder, but they’ve done some studies on leadership, and these four domains of leadership actually came from quite a large study on followers. So, if I look at your talent lineup, not to get too nerdy and distract from the story of you, I’ll give you the quick version. There are four different domains of leadership that people often find their strength in, and yours, to give you the tell as I lean into it, you come in really hot on the Strategic Thinking Talents, and then second highest your Influencing. So, there are four categories. You have the Relationship Talents. You have the Influencing Talents. You have the Strategic Thinking talents, the thinker guy that you probably are, and then you have Executing Talents. And so, as I listened to your reaction to the Monopoly thing, I could see you being really in your head about what was going on in the situation. Now you have a lot of fast-thinking talents, so Ideation is fast and Strategic is fast, so it’s not like you’re going to go deep and sit around and ponder things deeply for months. You can boom, boom, boom, react to that guy and have your answer. And I noticed your Influencing Talents are also high on your list. You have Activator, Woo, Communication up in your top 10. It’s interesting to see those two. How does that play into how you’ve seen yourself and your career? Pete Mockaitis: [00:17:12] Well, that is interesting. And what’s funny is I have a little bit of a hard time switching at times in that I really do like people and building relationships, and connecting and laughing and seeing how we’re similar and how we can help each other and collaborate and all those good things. That’s fun for me. But surprising, or I don’t know, just kind of part of how I go, is that when I get deep into the realm of this Ideation, Strategic, Input, Thinking and I’m trying to crack something, or figure it out, it’s just sort of like Peter in that game of Monopoly. And sometimes my wife will notice and she would like me to enter into people mode as we’re being together, or where she’ll just say, “Okay, you’re in your groove. Go ahead and finish that first.” So that’s the first thing that pops to mind there. Lisa Cummings: [00:18:45] What a deep powerful insight. I love hearing how the thinking stuff is playing out in your head, and then also the relationship part. So, I apply StrengthsFinder to work all the time and find that sometimes the easiest ones to get how you perform relative to other people is through people you’re really close to. So your wife probably knows you about as well as anyone in the world so she’s going to be more comfortable saying it out loud or noticing it or mentioning it. Do you happen to know hers? Has she taken this yet? Pete Mockaitis: [00:19:20] You know, I don’t think she has. Lisa Cummings: [00:19:22] Okay. Would be fun. So this could be one where you say, “Okay, look, your first Relationship Talent is Connectedness. It’s your number six. I hear you relying on it relatively often.” So you could ask a question like how could you lean on your Connectedness talent when you’re trying to consciously switch into a mode that would complement the conversation you two are having? Pete Mockaitis: [00:19:47] That is a great question. And, particularly Connectedness, that’s one of those words for the Strengths Finders that makes me think of, “Oh, like a super network.” But, no, no. Connectedness is more about having sort of like the faith in why things are the way they are or a higher power. And so, for me, that is big. And then your first Executing Theme is Belief and that, of course, I hear it in what you just said, and so it really helps me see when you say it. Oh, yeah, this would drive how you go about getting things done as well with the perspective of the meaning in your life and what is this all for and how does it play out. I also think this is the direction I’ll ultimately take it, because there are so many ways we could go from that conversation. So a lot of people struggle with this. You look at your lineup, and I’ve told you about these leadership domains, and you see, “Oh, my gosh. My first Executing Talent is number 12. This sounds like a person. Oh, no, I might be doomed. Does it mean I never get anything done?” Well, clearly you get a lot done. You are a machine it seems. So, where do you get your ability to achieve and get the outcomes and results you want? Because you clearly do. Pete Mockaitis: [00:22:00] How does it happen? Well, I think part of is just that I think about it in terms of I have a standard in mind in terms of how things should be or go. I think that’s kind of a vague broad thing to say. But, day after day, what mostly happens is I have kind of a picture in my head for what is done, good, complete, dream, nirvana state look like, and then I have all these ideas for what are the things that I could do that I couldn’t bring it there. And then I just become very excited about those ideas and I just sort of run after them. In terms of the CRMs, I was thinking, “I have a dream” – so dramatic. Lisa Cummings: [00:22:57] [laughs] Martin Luther Pete has a dream of CRM systems. Pete Mockaitis: [00:23:03] In which every guest that comes on my show will be absolutely outstanding, like leaving me and listeners with, “Wow.” Well, what’s it take to get there? Well, probably a fuller pipeline so that I don’t ever have a scramble in terms of, “Oh, I’m a little light on interview appointments. I better get some right away.” That’s like an obstacle to that is like when you have the time to patiently vet candidates as opposed to, “Oh, I’ve got to grab somebody,” then the odds are in your favor in terms of getting great ones. Lisa Cummings: [00:24:01] It’s really pretty deep what you just said because I could see Strategic helping you sort quickly, “Here’s the outcome. What’s the best way to get there?” Boom, your Activator says, “Go!” and then you create these systems and the insight that listeners won’t have, is that you and I have had some other conversations outside of this. Pete and I are pals. So we’ll talk podcast nerd-talk and he has all these great systems and team members who make things happen, and it actually is one of the great things you can do as Activator. You partner with people who see it through the finish line so that you can get the excitement at the starting line, and then other people can do the execution of the systems you’ve established and the vision you’ve created. So it’s actually a beautiful way you’ve worked through it. Pete Mockaitis: [00:24:43] Oh, thank you. You know, it’s so funny, when you say it like that I think, “Well, of course, isn’t that how everyone does it?” And the answer is I guess clearly, “No, it’s not.” Because I think, “Well, isn’t executing the same thing hundreds of times kind of dull?” But, no, some people are into that. Lisa Cummings: [00:24:59] A-ha. Okay. So, here’s the last topic we’ll bring up only because we’re running out of time because, geez, this would be so much fun to keep going and going and going. So that comment you just made made me think of the Talent Theme of Consistency, doing the same thing hundreds and hundreds of times. Well, it is Pete’s number 33 talent, so we call that a lesser talent, or maybe somebody else’s talent. Meaning somebody else, right? Yes, somebody else might get really excited about doing something the same way consistently over and over every day. But if Pete had to do that every day, what would work feel like for you? Pete Mockaitis: [00:25:37] Oh, it would just be so dull. It’s like I would want sort of some spark of newness to make it come together. Lisa Cummings: [00:25:48] This is a great way to end the show because living in your strengths makes you a stronger performer. Living in your strengths brings you energy and enjoyment about your job. If you’re pulling on your lesser talents, or someone else’s talents, all day every day, you feel drained, you feel burned out, and so many people feel like that and wonder, “You know, gosh, it’s not so hard and people are nice. So why do I feel like this?” And that’s often why, it’s because they’re calling on their weaknesses all day every day but they just don’t quite realize why. So, thanks, in an unexpected way, for illustrating that point because that is so powerful for people to have that insight. Pete Mockaitis: [00:26:25] Oh, thank you. It’s been a blast. Lisa Cummings: [00:26:27] It has been a blast. I’m so excited to have you here to do this. I wish we could triple down on it. Let’s get listeners over to you because you have so many great shows to help people be awesome at their jobs. So, where should they go to dig into your content, your training, your podcasts? Pete Mockaitis: [00:26:42] Oh, sure thing. Thank you. Well, I’d say if you’re already, well, you are a podcast listener, fire up your app and whatever you’re doing and search Awesome Job. That should be enough to pop up the show How To Be Awesome At Your Job. Lisa herself is a guest on an episode. You might check that out to get another flavor for her. Or just my website AwesomeAtYourJob.com. And it’s been fun. I’ve had about 130, wow, conversations with tremendous folks and every one of them is about trying to sharpen the universal skills required to flourish at work. So, whether you’re an executive, or a manager, or an individual contributor in marketing, or finance, or anything, it should be applicable because that’s kind of the primary screen we’re using. Lisa Cummings: [00:27:26] I second that. It is a fantastic show. I met Pete last year, and ever since leaving our meet-up in Chicago, I just have been an avid listener, and it’s just full of great guests and great tips. If you want to go back and listen through the lens of the StrengthsFinder Talents it’ll be really fun to do that. Also, for listeners, if you want some Strengths focus tools to use with your team at work, also check out LeadThroughStrengths/resources and you’ll get a bunch of great free info there. As we close episode, remember using your strengths makes you a stronger performer at work. If you’re putting a lopsided focus on fixing your weaknesses you’re probably choosing the path of most resistance. So claim your talents and share them with the world.